William Frost was a son of Thomas and Mary (nee Graham) and it is his line from which Alan is descended. Children born to Sarah Ann Bednall Sarah Ann Bednall; daughter of Joseph Bednall and Hannah Dakin (both of West Hallam) was William's first wife. 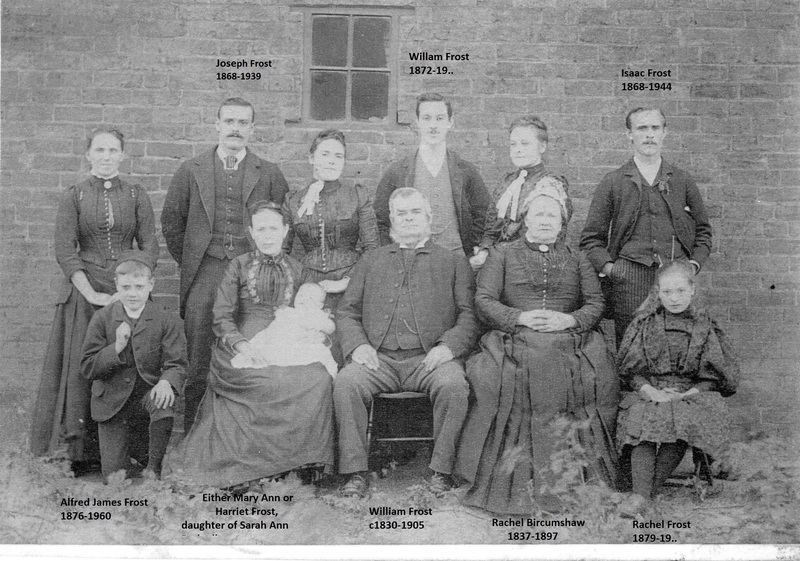 They were married in Ilkeston 2Q 1855 (Basford 7b 201); Sarah died in Ilkeston on the 9th of July 1860 (Basford 7b 49). Children born to Rachel Bircumshaw See later for Rachel. William Frost was born within the township of Ilkeston, Derbyshire. Unfortunately, both on a personal knowledge level or family ‘hand me down’ information; little is known of either William or Rachel, little known that is except for what can be gleaned from the census returns, for we are fortunate enough that William appears on the census (years dated 1841 to 1901), so in that respect we are at least able to paint an all to brief history of how his life was lived, though it does lack that sense of intimacy that family hand me down information can bring. Let us examine what the censuses show us.